How many times has your camping holiday been ruined or at least spoiled by rude, insensitive yobs or bogans? Don’t be one yourself – it’s not hard to follow some simple (if unspoken) rules that will ensure everyone has a great time. Following a few simple rules can keep you and your family from being labelled as rude, removed from a campsite or simply put – 'hated by fellow campers'. Bad behaviour can lead to arguments or even fights – not ideal! These rules have been passed down from generation to generation; please pass them on your children so we can go on enjoying camping in Tasmania for generations to come. 1. Respect your fellow campers, plain and simple. 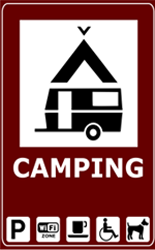 Be respectful, don’t camp to close to others, keep noise levels to a minimum and make sure noisy generators don’t run all night or when you are away from your campsite for extended periods. 2. Campers are some of the friendliest people you will meet, after all they are there for the same reason as you. 3. Leave no trace behind. My family always told us to leave it like you found it; clean up your mess and don’t destroy or damage the environment while camping. Simply pick and pack up your rubbish in your car and dispose accordingly. 4. Don’t feed animals at the campsites. Wild animals are sometimes seen as cute and adorable, but feeding them is never a good idea – especially possums in the Australian bush. Our native animals such as wallabies, wild birds, wombats and other marsupials will quickly become dependent on food scraps if you start to feed them. Don’t. 5. Don’t leave food, scraps or rubbish out at night. Contain it or hang it. Secure food in airtight containers or hang from a tree limb or hook. 6. Don’t every cut your own firewood, unless specifically identified that you can do so. If the campsite says don’t cut wood, then don’t. Simple. Either bring wood with you are in campsites where no firewood is permitted, use fuel stoves. 7. Playing music at your campsite is fine at most times, loud music all night is most assuredly NOT! Partying, playing loud music, swearing and generally engaging in loutish behaviour is probably the single most annoying issue, and biggest cause of complaints amongst campers. Have fun, enjoy your friends and your camping holiday but don’t ruin it for everyone through selfish behaviour. 8. Keep your dogs on a leash at all times. Again, barking dogs are a major cause of complaint at campsites as are dogs that roam looking for food or who scare small children. If the campsite so NO DOGS, then that’s what it means. How hard is this for people? If it stipulates Dogs On Leads At All Times, again – not hard to understand? Right? Keep your dogs under control. 9. If your campsite requires you to pay through an honesty system, then pay! It never ceases to amaze who may campers either arrive late at night and try to sneak out early the next morning or simply don’t pay for their campsite. Paying for camping is there for a reason, normally to assist with the costs of upkeep so the spot will be there for generations to come. 10. Take your grey water with you and dispose of in an approved dumping stations, or in grey water drains located in campground. Grey water is waste water from washing dishes, showering, bathing or from doing laundry. Dumping grey water into the environment can significant risk to public health due to the large amount of bacteria in the water. 11. Never leave your campfire unattended and always completely extinguish your campfire. Camping is potentially dangerous in the Tasmanian bush, especially in summer. Don’t take risks with fires and always make sure they are 100% extinguished before leaving. More often thatn not, if you are lucky, campsites will have Pit toilets. It might seem like a strange thing to say, but keep them as clean as possible and be considerate towards the next person. Put the lid down to avoid attracting flies - same goes for flush toilets and take a hint from the name! Press the damn button.If you drop toilet paper, pick it up. Showers should be left clean and tidy, take you old soap, paper or shampoo. Teach your children the proper use of campground facilities, they are not play areas for water fights or for playing in. Do not walk through other people’s campsites, walk around them and show some basic respect and common courtesy. And teach your children to do the same, other people's campsites are not play areas for your children or dogs that are not being controlled. It's not polite to simply wander through a camp that is already set up, however if you absolutely must offer a quick apology and keep moving. Sometimes you can accidentally come across a campsite, so people won't mind as long as you apologise and respectfully acknowledge them. Next time,go a different way.